I know this is going up a little late I am sorry. So let’s see what I have been loving this week. 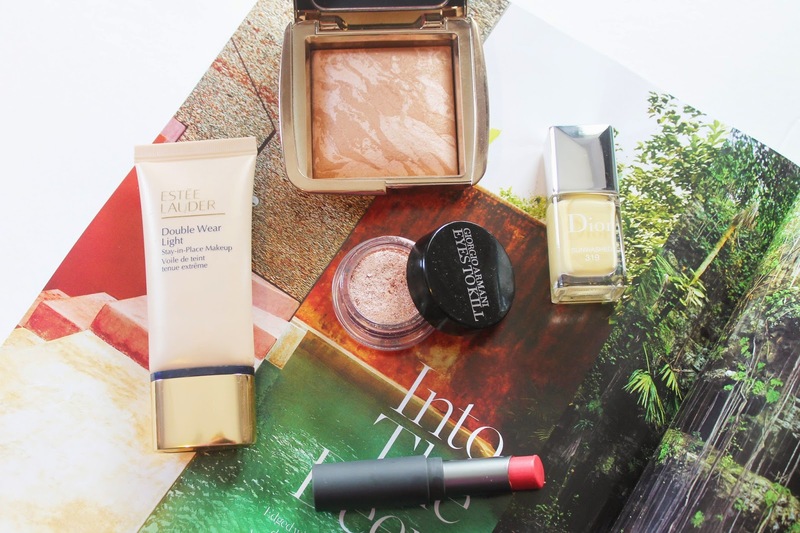 Estee Lauder Double Wear Light – I have had an acne flare up recently and this foundation helps cover them up but at the same time isn’t too heavy. Hourglass Luminous Bronzer – I have been using this all week to warm up my complexion. It is the perfect shade for me and leaves me with a nice glow. Armani Eyes to Kill #9 – Gold shades always look great with my blue eyes. This Eyes to Kill is a nice pale gold that I use all over my lid. Bite Beauty BB for Lips in Flush – I haven’t been using too much lipstick lately so for some color I have been turning to this. It leaves my lips moisturized and with a bit of color. Dior Nail Polish in Sunwashed – I am obsessed with this shade of pale yellow. It has been on my nails all week. It is perfect for the spring time. More too come this week. What have you been loving ? ?